« Crying Rooms: Do You Breastfeed in Your Place of Worship? upset was the idea of losing out on the opportunity to breastfeed. As she and her husband, Jonathan, planned the domestic adoption of their daughter Eliana, now 3, Danielle began researching induced lactation. She discovered the Newman-Goldfarb protocol for inducing lactation and had endless questions. Danielle met with a lactation consultant at the Breastfeeding Center of Pittsburgh, which she found helpful, but the visit was not covered by insurance because she didn’t yet have a baby and so this resource became cost prohibitive for her as she prepared to breastfeed the baby she’d soon adopt. She knew she’d use the pediatric practice associated with the Breastfeeding Center, Kids Plus Pediatrics, because one of their pediatricians specializes in supporting adoptive families. But what about her questions before her baby arrived? “It felt daunting,” she says. Danielle says her gynecologist (Pittsburgh-based Dr. Sharon Baer) went above and beyond, communicating with the doctors who’d written the protocol and finding out additional information. To induce lactation, Danielle needed a birth control pill with a high level of progesterone, so Dr. Baer prescribed Yasmin. In addition, Danielle needed a medication that would raise her prolactin level. Many mothers seeking to induce lactation use Domperidome, which is difficult to get in the United States as it is not FDA-approved for this purpose. The Edwards Family heard from their adoption agency that they would soon be getting a baby…very soon! “Our daughter’s birth mother was already 8 months pregnant when we found out, and she went into labor 2 weeks early.” The Edwards family arrived in California to meet their daughter shortly after she was born, and from the very beginning, “Eliana did everything at the breast,” says Danielle. She used a Lact-Aid nursing trainer system to provide formula for her daughter at the breast, while keeping up a pumping routine using a rented hospital-grade double electric breastpump. Danielle’s milk came in when her baby was 2 weeks old and Danielle was able to nurse her for a year with supplementation via the Lact-Aid. 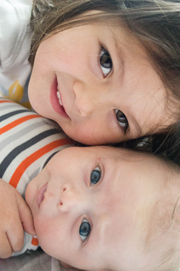 In 2014, the Edwards family had 2.5 months notice when they set out to adopt their son, Lucas, who is now 2 months old. Danielle was able to work with Dr. Baer to take her medications and began pumping in 2-3 hour intervals a month prior to his birth. “I even woke once every night to pump,” she says, until she built a supply that a 2-week old baby would need. 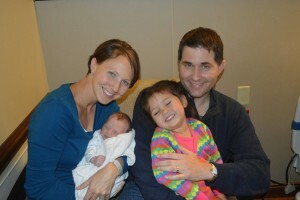 The Edwards family flew to Texas, where they were present for Lucas’ birth and Jonathan was able to cut his umbilical cord. Soon after, Danielle put Lucas to her breast. She says, “It was amazing. He was right on my chest trying to latch.” She was able to stay in the hospital with Lucas until he was discharged and was able to provide a full supply of milk for him. Danielle said she felt like she had a choice: use her time to pump and feed Lucas her milk in bottles, or else put him to breast and supplement her milk. “I chose to keep him at the breast,” she says. This decision has been a hard one for her, because she worked so hard to build up a supply. But in the end, Lucas loves his time at the breast. Danielle’s advice for other moms considering induced lactation? “Just give it a try. Inducing lactation seems so natural to me, and I wouldn’t have done it any other way.” Before having children, Danielle wanted to breastfeed because of the nutritional benefits. But now, having put her babies to her breast, she realizes the bonding aspect of breastfeeding is very valuable. Have you induced lactation to breastfeed without birthing? Leave us a comment to share your experience! I also induced lactation for my adopted son. We had a long lead time with him, so I had time to prepare!We’ve been very fortunate- he took to nursing and is still going strong at 13 months old! I’d love to spread the word to other adoptive parents that breastfeeding an adopted child is indeed possible! !